Until 1917, the State Printing Works in St Petersburg and then Petrograd - later part of Goznak and still in existence today - maintained very high standards as a security printer. Defective stamps were rarely produced and even more rarely got into post offices. Errors and even quite small varieties are regarded as very collectable by Imperial Russia specialists - in auctions, there are always bidders for such things. In 1917 - 1918 standards were not maintained and errors and varieties are more common - some may have been produced deliberately for sale. But they also got to post offices and can be found postally used. These 1917 - 18 errors and varieties are also collected, though they are not so expensive to buy. 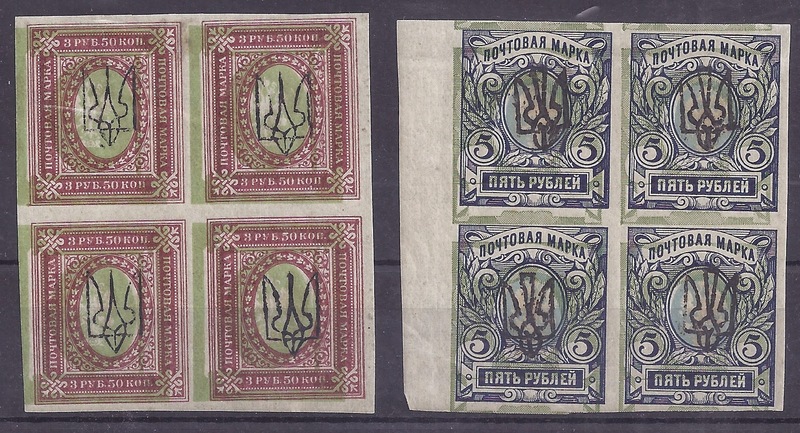 The stamps shown above with strongly shifted backgrounds got out of Petrograd and were distributed normally to what were then the postal districts of Kharkov and Odessa. In August 1918 or later, they received regular Trident overprints - Kharkiv type 3 on the 3 rouble 50 stamps and Odesa type 4 on the 5 rouble. Interestingly, these varieties are not sought after. For Russia specialists, these are not Russian stamps any more so the varieties are no longer interesting. And Ukraine collectors are mainly interested in the Tridents, not the basic Russian stamps. Just in practical terms, there are so many Tridents to collect that stamp errors and varieties cannot be allowed to get in the way of the main task. However, John Bulat does list quite a few of these varieties in his Ukraine catalogue: the shifted background of the 3 rouble 50 is listed as # 755d and valued at a modest $25 each for mint stamps; he does not list the 5 rouble variety for his # 1181. Postally used examples of such varieties are interesting because they indicate that not all of them got into the hands of philatelists. 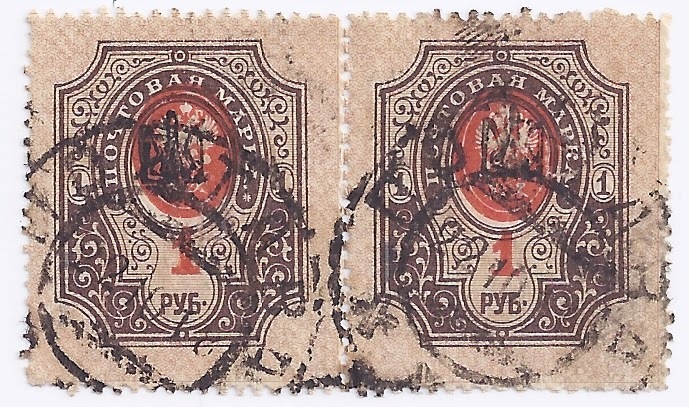 For example, the pair of stamps with Poltava 1 overprints (Bulat # 996) shown below have shifted centres - not very shifted but enough to be collectable. The stamps have punch holes,so came from a parcel card or money transfer form - so they aroused no philatelic interest before they were used in the normal way.